Even though it was very cold last night, with winter PJ's, flannelette sheets, a heat pack and a good heater we were nice and toasty warm in Myrtle. We headed off about 10.30 to eventually get onto the Kidman Way. We thought we might stay at Griffith but on driving through it just didn't do anything for us, so we decided to drive on to Hillston for the night. As we drove it became obvious why Australia's colours are so often Green and Gold. Between the Golden Canola against to lush green paddocks. The beautiful golden wattle next to the green leaves and then there were kilometres of yellow and green daisies along the roadside. Why wouldn't our colours be Green and Gold. 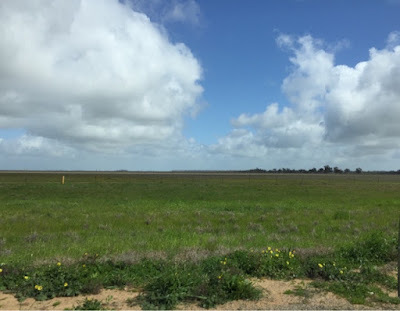 Most people would have heard the saying "This side of the Black Stump". In Australia there are lots of Black Stump locations with lots of different folklore. But today I heard to story of (supposedly) the original Black Stump folklore. 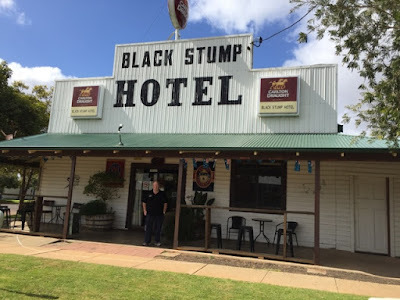 Driving along the highway we saw a sign for the Black Stump Hotel. Now we both love dropping into some old historic hotels so we definitely weren't going to miss this one. This hotel also has the tallest bar in the Southern Hempisphere. 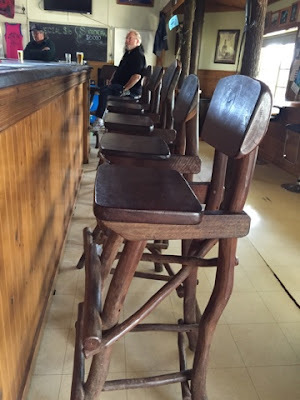 To match this very tall bar they had some very tall stools to sit at. They actually had a little ladder at the front so you could climb up them. When Shane climbed up I just couldn't stop laughing as he swung his short legs in the breeze. Now for the folklore that was explained to me by the publican. This areas folklore attributes this black stump story to the husband of the unfortunate Barbara Blain, who was buried in the Gunbar Cemetery in 1886. Local legend has it that her husband, a bullocky, instructed her to make a fire while he found feed for his livestock. The day was hot, windy and dusty. When he returned he found his wife had burned to death. 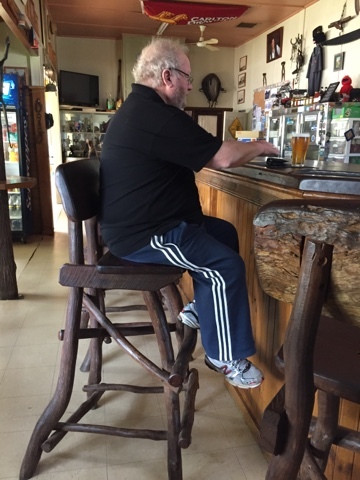 The story goes that when people sympathised with him he said "When I returned to the camp my wife was dead - she looked just like a black stump". So that is one piece of history I have learnt today. Tonight's definately not as cold as last night so should another good nights sleep, just wish my chest and head cold would leave me alone.